Nikon is pleased to announce the release of the D500, a DX-format digital SLR camera that packs the incredible performance of the D5, Nikon's flagship FX-format model, into an agile body. Aimed at passionate and serious enthusiasts, the Nikon D500 offers many of the professional features that exist in the D5, Nikon’s flagship FX-format model, into a compact, lightweight DX-format body. The D500 incorporates a powerful 153-point AF system to keep the pace of moving subjects, a 20.9-megapixel CMOS sensor for stunning resolution and a brand-new EXPEED 5 image processor to allow up to 10fps so that you never miss a moment of the action. It also offers a wide sensitivity range from ISO 100-51,200 (exp. 1,640,00) and is the first Nikon DX camera to utilise SnapBridge support and the new XQD memory card technology, which provides faster read/write and transfer speeds to take full advantage of its capabilities, such as 4K UHD in-camera video recording and time lapse. The D500's Multi-CAM 20K autofocus sensor module offers a dense configuration of 153 focus points (99 cross sensors) that covers an extremely wide portion of the image area, meaning that even fast-moving subjects can be acquired precisely. AF capability is extended down to -4 EV* with the central point and -3 EV* with all other points, making AF usable even in extremely low light or when shooting low-contrast subjects. A newly employed AF engine and 180K-pixel RGB sensor also contribute to achieving exceptional AF performance in a variety of scenes. *ISO 100, 20°C/68°F. The D500 delivers high-speed continuous shooting at approx. 10 fps*1 for up to 200 shots in JPEG and in 14-bit lossless compressed RAW, without any drop in shooting speed. Even moving subjects can be tracked accurately across a wide field of view at this rapid rate, taking advantage of the camera's stable viewfinder image and a widest-ever diagonal viewing angle*2 of approx. 30.8°. *1Approximate frame rates for a fully charged EN-EL15 Rechargeable Li-ion Battery, using continuous-servo AF, a shutter speed of 1/250 s or faster, and with other settings at default values. *2*As of January 6, 2016, among D-SLR cameras using an APS-C size image sensor. Based on Nikon research. 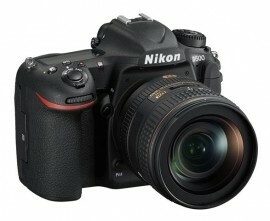 Nikon's DX-format D500 provides an angle of view equivalent to that of a lens with an approx. 1.5x longer focal length*1. This permits telephoto shooting using smaller, lighter lenses with a shorter focal length, while taking advantage of performance that rivals the D5 FX-format flagship model. The camera's agility is also enhanced by the kit lens, AF-S DX NIKKOR 16-80mm f/2.8-4E ED VR, the lightweight 5x normal zoom lens, which weighs only approx. 1340 g/2 lb 15.3 oz*2 when attached to the D500. *135mm-format equivalent. *2Including battery, XQD memory card and lens. The D500 can record 4K UHD (3840 x 2160)/30p/25p/24p as well as 1080/60p video for up to 29 min. 59 s*1, with simultaneous output via HDMI available. It is also possible to generate 4K UHD time-lapse movies within the camera. In Full HD or HD mode, the D500's electronic Vibration Reduction function*2 reduces the effects of camera shake in the horizontal, vertical and rotational directions during hand-held movie recording, while Active D-Lighting preserves details in highlights and shadows to capture footage with natural brightness. *1Recorded in separate files. *2Image area will be slightly smaller in DX-based movie format. The D500 can be constantly connected to a smart device* with the SnapBridge application installed (to be available as a free download), via Bluetooth or Wi-Fi. This enables a variety of features: you can automatically transfer images taken with the D500 to your smart device, as well as upload them automatically to NIKON IMAGE SPACE. You can also use the smart device to browse images stored in the camera, as well as embed images with its location and date/time information. SnapBridge dramatically enhances the value and convenience of images taken with the D500. *Smartphones and tablet computers with iOS or Android™. Nikon's WT-7/A/B/C Wireless Transmitter is aimed at professionals who need to transfer images more quickly than they can with built-in wireless LAN. 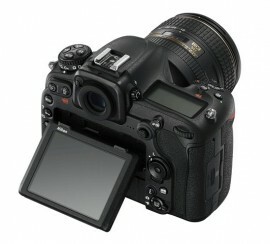 When attached to the D500, it allows images and movie files to be transferred to computers* or FTP server via both wired and wireless LAN. The D500 with WT-7/A/B/C can be used as a wireless LAN access point, permitting easy connections with computers and smart devices. *Requires Wireless Transmitter Utility (available for download from Nikon website).